Tim Wu [Twitter: superwuster] is giving a talk jointly sponsored by the Shorenstein Center and the Berkman Klein Center. His new book is The Attention Merchants. He is introduced by Erie Meyer, a Shorenstein fellow this year. Tim begins by noting that he was at the Berkman Center at its beginning, when it was pretty much just Charlie Nesson and Jonathan Zittrain. He says that his new book is the “history of a business model”: the re-sale of human attention. This model has “long anchored the media,” but now has “exploded into all parts of our lives.” It’s part of many business models these days. Even the national parks are selling naming rights to trails. 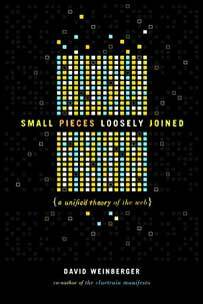 “Maybe a thousand times a day, something tries to get us to spend maybe a micro-second” to notice something. 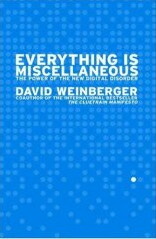 “The deepest ambition of the book is to say that this is having an effect on the human condition.” He points to the casino effect where you get distracted by links and an hour later you say, “What just happened?” He’s concerned about a model that has us taking our attention away from people and our surroundings and into a commercial space. The book is a history, he says. “”Newspapers once upon a time were not a mass media.” In 1830 NY’s biggest paper’s circulation was 2,000.”“Newspapers once upon a time were not a mass media.” In 1830 NY’s biggest paper’s circulation was 2,000. Papers were expensive. So, Benjamin Day — “the first attention merchant” — lowered the price of his paper to a penny, and covered a broader range of topics, “human interest stories for a mass audience.”. E.g., the first story in his paper, The NY Sun, was about tragic lovers. He was selling his audience to the advertisers. ERIE: You say in the book that trash-talking grabs our attention. TIM: Many of the current techniques are quite old. E.g., Trolls. The NY Sun attracted competitors, including the NY Tribune. The Trib got attention by picking fights with other newspaper editors. He was the first troll. It worked. “We’ve seen recently that you can run an entire campaign just by insulting people.” The Sun fought back with even more salacious stories. E.g., “it reported that a scientist had discovered life on the moon, including trees, horse-like animals, and man-bats. They never retracted it.”it reported that a scientist had discovered life on the moon, including trees, horse-like animals, and man-bats. They never retracted it. ERIE: As you point out, one of them grabbed attention by being pro-Abolition, which caused the others to become rabidly anti-Abolition. TIM: The book doesn’t totally condemn that attention-seeking model, but it warns about its tendency to run to the most lurid content. This makes for constant ethical problems. TIM: “Orpah Winfrey is one of the great innovators in this area.” She was a fully integrated celebrity, production company, advertising company, and a tv network, all in one. She created product endorsements that drove a lot of advertising. She also married the appeal of ministry (salvation, forgiveness, transcendence) and commercialism. By 1995, she was making more money in entertainment than anyone else and gave rise to celebrities who are themselves attention merchants. E.g., Martha Stewart, Donald Trump: the celebrity builds her/his own media empire. Tim expects this to be the future. One of the subtexts of the book, Tim says, is that the value of human attention was not widely recognized until the 20th century, except for organized religion. The entities interested in what you spent your time doing, before the 20th century, were organized religions that wanted you praying, and going to church, and in various ways to keep God on your mind.” In some ways, Tim says, the story of the book is the story of government and business figuring out that this is valuable resource. The govt realizes it when they see they can raise an army through govt propaganda. Industry, after govt, realizes they can sell products if they have public attention. ERIE: Can you talk about micro-celebrities? You can control attention to some degree, but it’s always darting around, and you can really only attend to one thing at once. ERIE: “You’ve said that if you have a mission in life, it’s to fight bullies.” What should aspiring entrepreneurs do? TIM: I struggle with this. “A lot of people who have gone into tech have been very idealistic people.” The pay-for-content models haven’t worked so well. One chapter tells the story of decision-making at Google. At one point, it was bleeding money and didn’t know what to do, so they thought about advertising. But in 1996 Larry Page had written a manifesto that declared that advertising-funded search engines will always be biased and will never serve the interests of people. But Google thought it could square the circle with Adwords: a form of advertising that made the product better and didn’t bother people. That was true at the beginning. If an ad showed up, which usually didn’t happen, it’d be useful to you. Tech is a key driver these days, he says. “Which has changed your life more? Government or tech?” I wish Google had considered a different kind of corporate form or model. “I give Wikipedia a lot of credit for going non-commercial. I give even more to the original creators of the Internet who just built it and put it out there.” E.g., the creator of email didn’t look for a business model. Likewise for the creators of the Internet Protocol or the Web. ERIE: Have you ever clicked on an ad on purpose? TIM: I think yes. I think I wanted to buy those razors. Q: Two positive examples: FB put out the call to register to vote. Services raise money for worthy causes. A: Yes. Gathering up attention for some purpose isn’t inherently good or evil. The book argues for carving out quiet spaces, but I believe in the Habermasian public sphere. Q: Platforms can abandon ads but show us content based on who pays them. How can we rebel against what we can’t see? Q: How about “Society as Spectacle“? And Kevin Kelly’s True Fan theory? A: Paid models support a much broader variety of content. Ad models require the underlying content to more generally be mass content. That’s one of the reason that TV has gotten better over the past fifteen years. Ad supported TV drove to the middle. TV now gets 50% of its revenue from non-advertising. Q: What’s been your hardest struggle to regain control of your attention? A: All books probably come from a personal place. Control of attention is a struggle for me. One of the places I decided I needed to write this book was during a 10-day solo trip in the Utah desert. Time seemed to pass in very different ways. An hour could feel like a week. I felt like the modern regime was having me lose control. I like the Web, but I found I didn’t like the way I’d spent my time. I wish I’d spent time on activities I’d consciously chosen. I like JS Mills’ Chapter 3: Life is a matter of autonomy and self-development, and you need to make decisions that are yours. Q: Is your a book is a manifesto for policy change, or a self-help book? A: Can I have a third option? Q: Are there policy implications? A: I struggled with how much to make this legally prescriptive. Should I end the book with policy proposals? I decided not to, for a number of reasons. One had to do with craft: those last chapters of policy prescriptions, after a book covering 200 years, are usually pathetic. It’s very hard to regulate well. A lot of it has to do with how people conduct their lives. Policies aren’t sensitive to individual situations. I have complex feelings about it and didn’t want to cram into the book. And then people focus on those prescriptions at the expense of the rest of the book. Q: Is commerce in attention span part of a democracy? People have to learn things they would not willingly learn. A: If we perfect our filters, we may live in worlds where we learn only what we want to learn. I have complicated ideas about this. The penny press did a good job of creating the sense of a public and public opinion. But I resist the idea that to be a democracy we have to all attend to the same sources of information. “In the 19th century, America was a flourishing democracy and there was no national media”In the 19th century, America was a flourishing democracy and there was no national media, and lived in geographically defined filter bubbles. I don’t pine for the 1950s when everyone watched the same news broadcasts. Building one’s character means making your own information environment. Here’s a spoiler based on nothing. Please note that I’m never right. I found this on Reddit. Can you tell what it is? These are words we need to hear. I will so miss her voice. I hope she will stay where we can hear her. He begins with a hypothetical in which you can swerve a car to kill one person instead of stay on its course and kill five. The audience chooses to swerve, and Edmond points out that we’re utilitarians. Second hypothesis: swerve into a barrier that will kill you but save the pedestrians. Most of us say we’d like it to swerve. Edmond points out that this is a variation of the trolley problem, except now it’s a machine that’s making the decision for us. Autonomous cars are predicted to minimize fatalities from accidents by 90%. He says his advisor’s research found that most people think a car should swerve and sacrifice the passenger, but they don’t want to buy such a car. They want everyone else to. He connects this to the Tragedy of the Commons in which if everyone acts to maximize their good, the commons fails. In such cases, governments sometimes issue regulations. Research shows that people don’t want the government to regulate the behavior of autonomous cars, although the US Dept of Transportation is requiring manufacturers to address this question. Edmond’s group has created the moral machine, a website that creates moral dilemmas for autonomous cars. There have been about two million users and 14 million responses. Some national trends are emerging. E.g., Eastern countries tend to prefer to save passengers more than Western countries do. Now the MIT group is looking for correlations with other factors, e.g., religiousness, economics, etc. Also, what are the factors most crucial in making decisions? They are also looking at the effect of automation levels on the assignment of blame. Toyota’s “Guardian Angel” model results in humans being judged less harshly: that mode has a human driver but lets the car override human decisions. In response to a question, Edmond says that Mercedes has said that its cars will always save the passenger. He raises the possibility of the owner of such a car being held responsible for plowing into a bus full of children. Q: The solutions in the Moral Machine seem contrived. The cars should just drive slower. Q: Have you analyzed chains of events? Does the responsibility decay the further you are from the event? This very quickly gets game theoretical. At the PAPis conference Bas Nieland, CEO and Co-Founder of Datatrics, is talking about how to predict the color of shoes your customer is going to buy. The company tries to “make data science marketeer-proof for marketing teams of all sizes.” IT ties to create 360-degree customer profiles by bringing together info from all the data silos. It is structured around a core API that talks to mongoDB and MySQL. They provide “workbenches” that work with the customer’s data systems. They use BigML to operate on this data. They predict the increase in sales for each action, and quantify in dollars the size of the opportunity. They also classify responses by customer type and phase. For a hotel chain, they connected 16,000 variables and 21M data points, that got reduced to 75 variables by BigML which created a predictive model that ended up getting the chain more customer conversions. E.g., if the model says someone is in the orientation phase, the Web site shows photos of recommend hotels. If in the decision phase, the user sees persuasive messages, e.g., “18 people have looked at this room today.” The messages themselves are chosen based on the customer’s profile. Take-aways: Start simple. Make ML very easy to understand. Make it actionable. Me: Is there a way built in for a customer to let your model know that it’s gotten her wrong. E.g., stop sending me pregnancy ads because I lost the baby. Me: Is that on the roadmap? The main challenge: Most of the players play for free. Only 2% ever spend money on the site, buying extra money to play. (It’s not gambling because you never cash out). 2% of those 2% contribute the majority of the revenue. All proposed changes go through A/B testing. E.g., should we change the “Buy credits” button from blue to red. This is classic hypothesis testing. So you put up both options and see which gets the best results. It’s important to remember that there’s a cost to the change, so the A-B preference needs to be substantial enough. But often the differences are marginal. So you can increase the sample size. This complicates the process. “A long list of changes means not enough time per change.” And you want to be sure that the change affects the paying customers positively, which means taking even longer. When they don’t have enough samples, they can bring down the confidence level required to make the change. Or they could bias one side of the hypothesis. And you can assume the variables are independent and run simultaneous A-B tests on various variables. High 5 does all three. It’s not perfect but it works. Second, there is a poularity metric by which they rank or classify their 100 games. They constantly add games — it went from 15 to 100 in two years. This continuously changes the ranking of the games. Plus, some are launched locked. This complicates things. Vinny’s boss came up with a model of an n-dimensional casino, but it was too complex. Instead, they take 2 simple approaches: 1. An average-weighted spin. 2. Bayesian. Both predicted well but had flaws, so they used a type of average of both. Third: Survival analysis. They wanted to know how many users are still active a given time after they created their account, and when is a user at risk of discontinuing use. First, they grouped users into cohorts (people who joined within a couple of weeks of each other) and plotted survival rates over time. They also observed return rates of users after each additional day of absence. They also implement a Cox survival model. They found that newer users were more likely to decline in their use of the product; early users are more committed. This pattern is widespread. That means they have to continuously acquire new players. They also alert users when they reach the elbow of disuse. 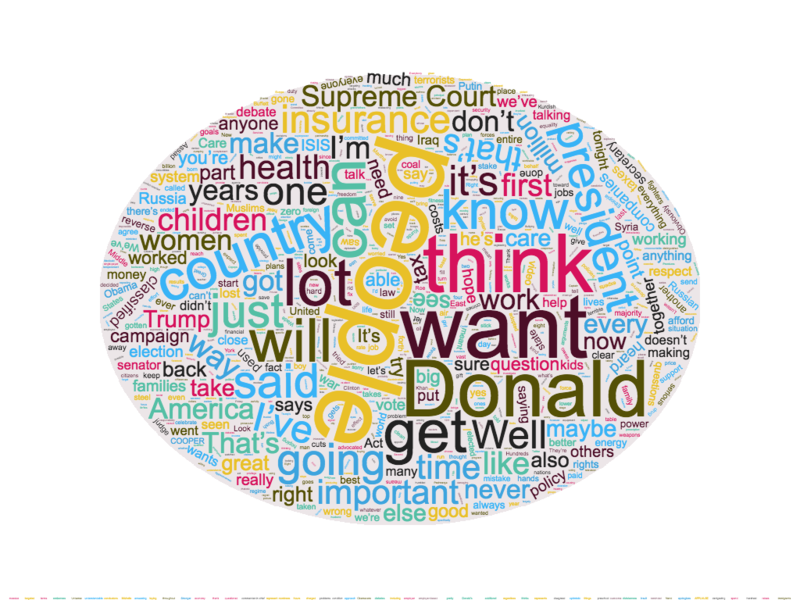 Here are wordclouds, generated by WordClouds, for the entire debate last night, and for Clinton and Trump. Here’s the transcript. 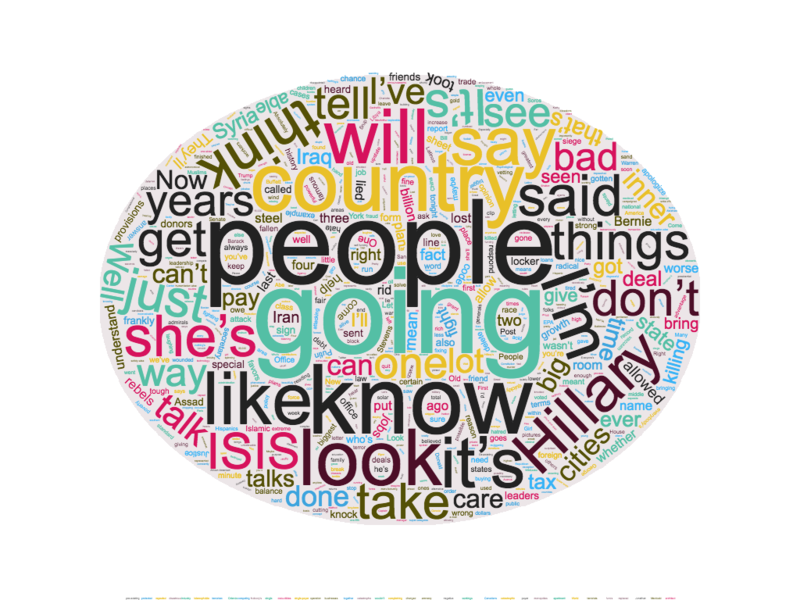 By the way, according to the tool at Planetcalc, Trump used 1,162 unique words; Clinton used 1,242. According to Readability-Score, Trump spoke at a 7.6 grade level, while Clinton spoke at a 9.0 grade level. Yay for democracy.